With the increase in the longevity and demands of the patients’ hip and knee replacement surgeries are tremendously on the rise. In India when compared to the western countries, degenerative arthritis of the knee joint is at least 10 times more common than the western population. And hence it is not uncommon to see people more than the age of 60 years to have a bow-legged deformity. The older concept of retaining their own joints and tolerating pain, deformity and restricting their lifestyle and social activities is slowly mitigating away. The Indian population is emerging out of its taboos and myths. Currently almost all joints of the body, including the small joint of the fingers can be replaced by well engineered and follow up documented prosthesis. Due to the import of the prosthesis the price of them is placed slightly on the higher side. Of late Indian companies have started manufacturing these prosthesis so that the patients will be benefitted at more subsidized costs. The more common deformity of the knee joint is the bow-legged deformity (VARUS). The less common is valgus deformity. Whatsoever is the amount of angular deformity the knee joint can be very precisely corrected to its original anatomical dimensions. In case if there is any bone loss it can be managed bone grafting procedure. If the ligaments around the knee joint are unstable a constrained type of prosthesis can be implanted. In case if the primary surgery fails either due to excessive wear and tear or due to periprosthestic fracture, a revision total knee replacement with long stemmed prosthesis. Recently high flexion knee have been introduced to provide maximum flexion of the knee joint so that sitting in the figure of O manner is possible. In hip replacement surgeries a variety of choices of implants are available. 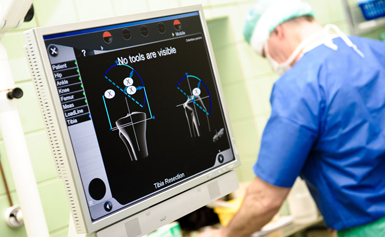 The choice of the implant is decided based upon the demand of the patient, age and presence of bony abnormalities. Recent introduction is the hip resurfacing surgery wherein the head of the femur is trimmed and a steel cup is implanted over it. This means there is a perfect anatomical restoration of the morphology and kinematics of the hip joint. After performing this surgery patient is allowed to go back to his original sporting activities and is able to squat on the floor. The approximate duration of stay in the hospital would be five days and there after the patient is advised to undergo intensive physiotherapy for a period of at least six weeks to strengthen the muscles and to get back the original gait. Prior to the surgery a proper pre operative evaluation is performed to rule out any focus of infection. Also a through clinical cardiac, pulmonary and renal function is worked up. Joint Replacement Fellowship, Breach Candy Hospital, Mumbai, Knee Fellowship, UK.